The broader markets have had a strong year, but the best stock sectors of 2013 averaged gains more than twice as high as the Dow Jones Industrial Average. For the year, the Dow is up 21%, the Nasdaq 33%, and the S&P 500 25%. 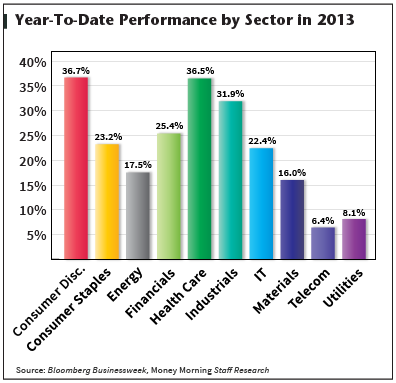 But the top-performing sector of 2013 is up nearly 37%. In fact, the top five sectors' year-to-date gains range from 23% to 37% – compared to a range of 15.2% to 27.4% for the top five sectors in 2012. 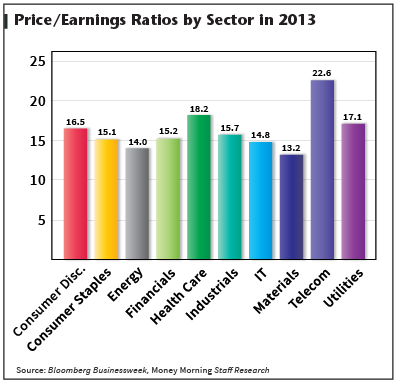 Here's the year-to-date performance for 10 major sectors, as well as a breakdown of price/earnings ratios and dividend yields. 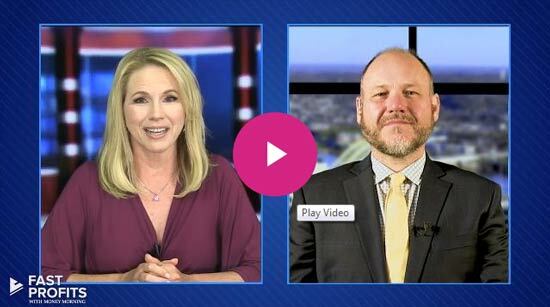 Special Report: The market's most powerful trading indicator has delivered us triple-digit gains… Here's how to play it. It can be difficult to compare stocks of different sectors on their price-to-earnings (P/E) ratios, since growth prospects for companies can vary greatly between industries. Typically, the technology sector has a higher P/E ratio than others, like utilities, as technology companies traditionally have higher growth potential. For comparison, the S&P 500 has posted an average P/E ratio of 19.58 since 1998. 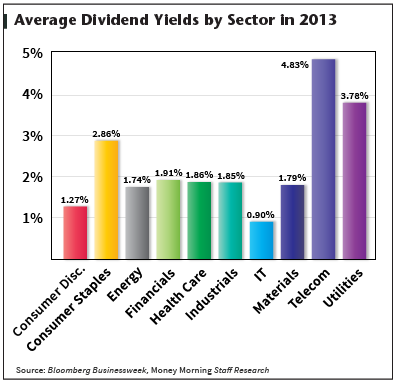 Those who invested in the telecom sector this year may have brought in the smallest gains, but they also brought in the largest dividend yields on average in 2013. A hefty dividend yield can make even an uninspiring stock performance a worthwhile purchase. *All sector information as of 12/12/13 market close. One real good thing for investors about Utilities in general: Everyone needs them and they have to pay the utility bill first, most often. So, they have a regulated area and no competition to speak of. Dividends are quite secure in most any economy or situation because they are necessities. You could even call them recession proof businesses. In hard times you skip the restaurant meal and cook at home. So, you have to pay the gas or electricity bill to say warm all Winter. Still, Utility stocks can go down in a bear market and recession along with all the others, but probably they are less volatile than technology, for example.